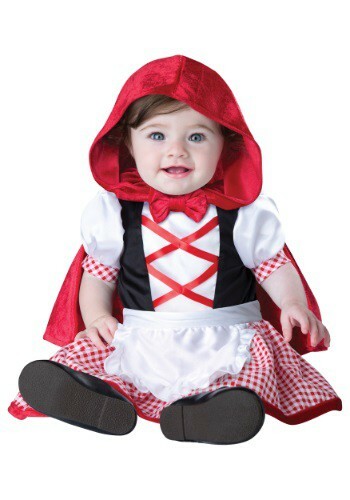 I ordered this costume for my 6 month old daughter after receiving the 0-6months size I attempted to try it on her only to find out the arm holes were so small her hand barely went through them and then no further up her arms. So I sent it back and ordered the next size up which is 6-12months which says it fits 16-23lbs. She weighs 18 lbs so it should be perfect. I received yesterday and arm holes were still too small. I had to cut elastic inside sleeves because I was not paying another 8 dollars to have a new size reshipped. So the rest of the outfit fit fine and after cutting the elastic the sleeves finally went up her arms which are no bigger than the baby pictured. Be advised. My daughter had the costume on for less than 5 minutes and it started to fall apart. Won’t be purchasing from this website again.